Microbial association with seeds as endophyte may play significant role in its germination and seedling establishment. However, the microbial communities associated with seeds and its diversity are still unexplored due to the difficulties in the characterization of spermosphere and its temporary duration and also due to the complexity of interactions involved. The rapidly changing spermosphere is a microbiologically rich area where interactions between seed and associated microbial communities take place. Recent technological advances are giving us significant promises to study the characteristics of seed exudates, microbial communities, and their mechanisms of interactions with seed and soil. In this chapter, we focused on the current understanding concerning the spermosphere and endophytic microbes that have been isolated from seeds of different plant species. 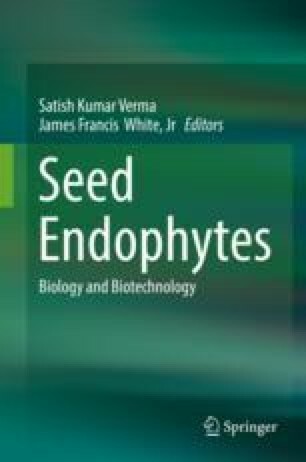 Endophytic colonization route and mode of transmission to the seeds and mechanisms of interaction are also considered under the purview of this chapter. In addition, examples of recent techniques used for the characterization of seed microbiome are also given.